The paramyxoviruses are a group of negative-sense, single stranded RNA viruses in the family Paramyxovir- idae (order Mononegavirales), that cause a considerable global human and animal health burden. Nipah virus (NiV) was first identified in 1998 in Malaysia, where it caused an outbreak of respiratory and neurological disease in pigs and encephalitis in people. Three years later, in 2001, a geographically- distinct NiV strain independently emerged in India as well as in Bangladesh, where human NiV outbreak events have been reported nearly every year since. To date, Nipah virus has caused more than 600 cases of human infection in Malaysia, Singapore, India and Bangladesh, with fatality rates ranging up to 100% for some outbreaks. Worryingly, human-to-human transmission has been observed in Bangladesh as well as in India. NiV has a broad host range and induces severe, acute disease in many mammalian species following either natural or experimental exposure. In people, central nervous system infection manifests as two main disease presentations: acute, febrile encephalitis with vasculitis and systemic virus replication and a neurological disease syndrome; and relapsing or late-onset encephalitis. In the latter case, infection appears to be confined to the central nervous system; disease may manifest months to years after infection; and risk factors and mechanisms for persistent CNS infection and disease recrudescence are unknown. In acute cases, a respiratory syndrome is also variably described that may or may not be accompanied by encephalitis and neurological disease. Nipah virus isolates from Malaysia (NiV-MY) and Bangladesh (NiV-BD) form two genetically distinct strains. 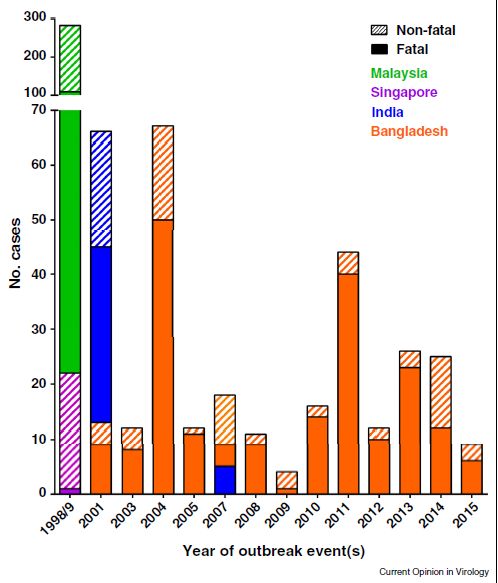 In Bangladesh, respiratory disease incidence and severity have been greater than for infected people in Malaysia. This difference has been proposed as an underlying factor driving differences in transmission between NiV outbreaks in Bangladesh – where human-to-human transmission is a major pathway for infection – and Malaysia, where people acquired their infections from pigs and there was little evidence of onward transmission. 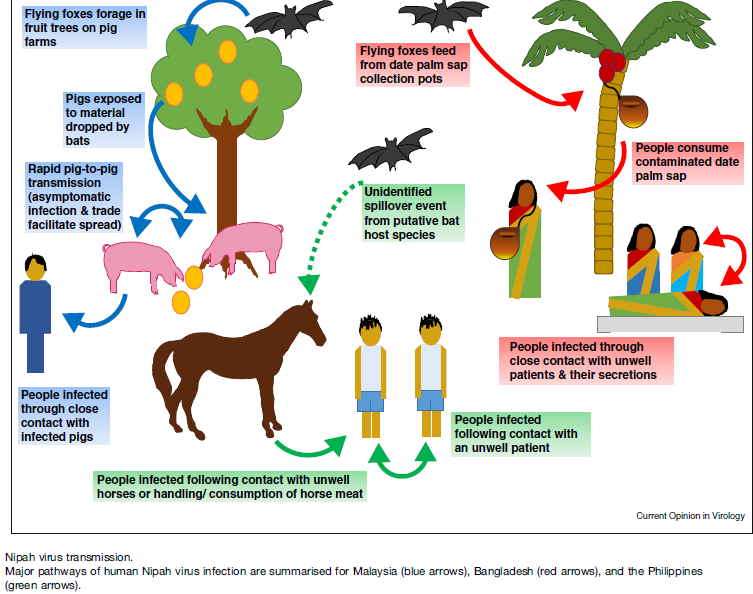 Introduction of NiV infection into the human population occurs by two mechanisms of spill-over from flying foxes: transmission via an intermediate animal host, which precipitated the outbreak in Malaysia; and bat-to-human transmission, which has occurred in Bangladesh and India. Transmission via an intermediate animal host as well as food-borne transmission of a putative NiV were observed in the Philippines. In Malaysia, the highest risk of human NiV infection was associated with activities involving close contact with and handling of pigs, and transmission to people is thought to have occurred through direct contact with infectious secretions or excretions of pigs. In Bangladesh, the two most common risk factors for human NiV infection are drinking contaminated date palm sap or its fermented product and contact with a patient with Nipah encephalitis. These reflect the two main mechanisms of human infection observed in Bangladesh, as well as in India: bat-to-human and human-to-human transmission. In a small number of instances, direct contact with infectious material left by foraging bats in trees or on fruit may have also played a role in bat-to-human transmission, and domesticated animals such as cows, goats and pigs may also pose infection risks to people. Published literature is sparse. Goh et al2 studied the clinical features of NiV encephalitis among pig farmers in Malaysia. Neurologic features predominated the patient series. Pinpoint pupils with variable activity, abnormal doll’s-eye reflex, bilateral ptosis were some of the signs observed and were associated with a higher mortality. Lim et al3 in their case series of 13 patients reported visual symptoms in 5 patients. Diplopia, nystagmus, VI CN palsy, blurred vision, Horner’s syndrome, BRAO were some of the findings seen. Clayton BA. Nipah virus: transmission of a zoonotic paramyxovirus. Curr Opin Virol. 2017; 22:97-104. Goh KJ, Tan CT, Chew NK, et al. Clinical features of Nipah virus encephalitis among pig farmers in Malaysia. N Engl J Med. 2000;342(17):1229-35. Lim CC, Lee WL, Leo YS, et al. Late clinical and magnetic resonance imaging follow up of Nipah virus infection. J Neurol Neurosurg Psychiatry. 2003;74(1):131-3.